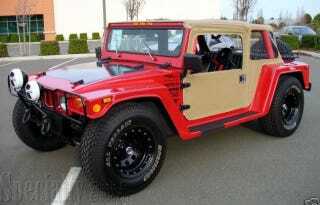 This kit car looks to be hybrid of a Baja bug and a Hummer H1. But it also could represent what a modern VW Thing would have looked like had that VW jeepster not gone the way of "Archie Bunker's Place." Nonetheless, this kit's called the Humbug (go figure), and this specimen reportedly cost $35,000 to build. Bidding stands at $12,000 currently.